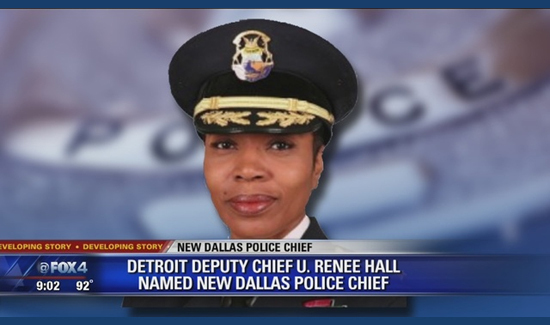 DALLAS — From a podium in Detroit, Deputy Chief U. Renee Hall said Wednesday she was honored and blessed to be chosen as the new Chief of Dallas Police. “The other DPD will be the best DPD,” she said, to laughter and applause from the Detroit crowd. Hall’s ties to law enforcement started at birth. Her father was an officer, killed in the line of duty in 1971 when she was just six months old. She joined Detroit Police in 1999. Michael Mata, president of the Dallas Police Association, says what she lacks in years of experience is overshadowed by what she’s dealt with in Detroit. Problems her new department knows well. “They had a huge morale issue, especially with their pension issues, so coming here and helping to bring back our morale I think is one of her paramount abilities that she can bring to Dallas,” he said. Chief Hall is also now the third minority woman leading Dallas County’s largest law enforcement agencies, joining Sheriff Lupe Valdez, and District Attorney Faith Johnson. “I did have an opportunity to call her and congratulate her on the position and she was so excited,” said Johnson, in her office Wednesday. The DA says she is most impressed by Hall’s work with neighborhood policing, and the drive to help people she says all three women share. “You’ve got women who are not just women but we’re qualified women, and we’re capable and we’re strong women and we’re committed women to this county, to this city,” said Johnson. And Hall aims to show that to the people she’ll now lead and the community she’ll now serve. “Any young lady interested in law enforcement – go after your dreams, follow your heart, and one day you too can stand as a chief of police in a major city,” she said. Hope she does better then the women have running our education system. We have a new black woman police chief and she has told our officers not to check when making a stop if those people are legal citizens.